The Illinois Fighting Illini came into Thursday’s game with 27 straight victories. They had gone 53 days without a defeat. But after an encounter with Brian Shaffer the Illini find themselves in the Big Ten Tournament losers bracket. The true freshman tossed seven innings of one-run ball, tying a career high in strikeouts with seven, and leading Maryland to a 2-1 victory. After the Illini strung together three singles in the first to take the early 1-0 lead, Shaffer buckled down. He allowed just three subsequent hits over his remaining six innings, and walked just one batter. The Terps took the lead in the top of the second when the Illinois defense let down starter Drasen Johnson. Kevin Martir led off the inning with a single, and then after Jose Cuas reached on an error by Johnson himself, Anthony Papio stroked a pitch the other way, through the left side, bringing home the Terps first run. Nick Cieri then grounded back to Drasen who elected to throw to third base to get the lead runner in Cuas, but the return throw to first by Ryne Roper sailed down the right field line, and Papio scored all the way from first to give Maryland the 2-1 lead. That was all the Terps would need. In relief Rob Galligan worked a scoreless eight, striking out two, and Kevin Mooney struck out two of his own in the ninth to earn his seventh save of the season. With the win tonight the Terps get a day off Friday, and will await the winner of (6) Indiana and (2) Iowa. The Terps could use the rest. They have been on the road since traveling to face Northwestern over a week ago. It was no more apparent than in the fifth inning when Martir started trotting down to first on ball three. When he returned to the batter’s box home plate umpire Jim Schaly busted the Maryland catcher’s chops a bit, asking if he was a math major. Martir would go on to walk anyway. The game on Saturday will be a 10 a.m. EST start, after the Terps have played back-to-back games ending in the wee hours of the morning. If the Terps win Saturday they will advance to the championship on Sunday. If they fall, they will play an elimination game Saturday afternoon at 6 p.m. EST. Maryland got just enough offense to beat Michigan State 2-1 in their first ever Big Ten Tournament game Wednesday night at Target Field in Minneapolis. Terrapins’ ace Mike Shawaryn worked seven innings of one-run ball, striking out nine and walking only two. Shawaryn picked up his twelfth win of the season, which breaks his own school record from last year. The righty is now 3-1 with a 3.08 ERA in four career postseason starts. He is 2-0 with a 0.64 mark in conference tournament games. He shut out No. 4 Florida State over seven innings of work at last year’s ACC Championships. 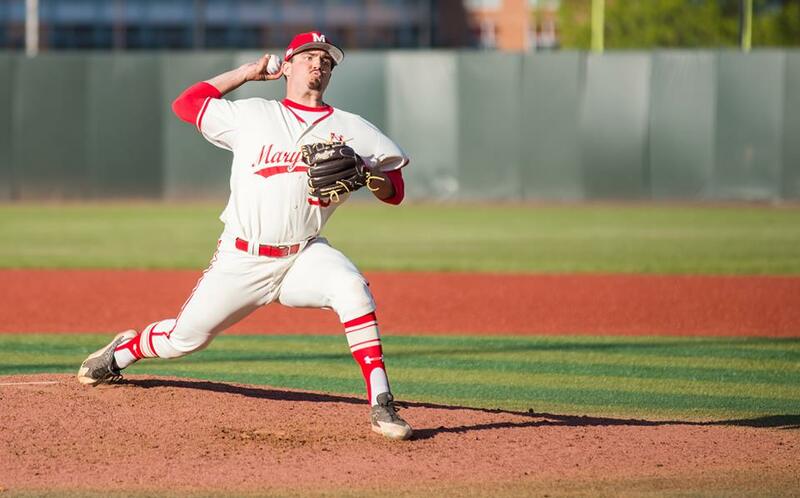 Terps sophomore Mike Shawaryn broke his own single-season wins record Wednesday. “You have success in tournaments like this with good starting pitching and good defense,” Maryland head coach John Szefc said. The Terps didn’t commit an error in the game. Shawaryn did allow one run on four hits through the first three innings, putting the Terps in a shallow hole. But the deficit was short-lived. Trailing 1-0 in the fourth inning, the Terps got the first two men aboard when Kevin Smith reached on an error and Brandon Lowe singled him to third. Third baseman Jose Cuas drove in Smith on a groundout to third base, tying the game at one. Maryland would string together singles from Nick Cieri, Kevin Biondic and Kevin Smith to take the lead in the fifth. Smith’s go-ahead single up the middle came with two outs in the inning and plated Nick Cieri, who returned Wedensday night after missing two months with a hand injury. Lowe finished 2-for-3 with a walk, and Kengo Kawahara reached base in two of his three plate appearances. With the win, the Terps (37-20) move into the winner’s bracket in the double-elimination Big Ten Tournament. They will take on Drasen Johnson and No. 4 Illinois tomorrow night at 10 p.m. MBN will be live from Target Field at 9:40. The Maryland Terrapins (36-20) defeated the Northwestern Wildcats (18-36) by a score of 4-3 in their regular season finale to avoid a sweep. 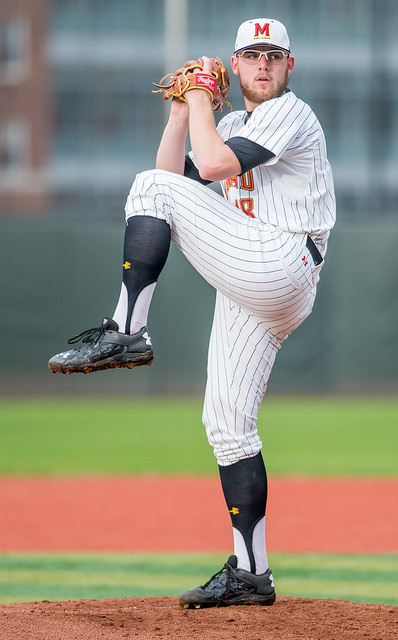 Ryan Selmer made his first collegiate start for the Terps and pitched fairly well. He lasted six innings, allowing three runs, although only one was earned. The runs he allowed all came early. In the first inning, a Scott Heelan sac-fly brought in leadoff hitter Kyle Ruchim. In the third, a Justin Morris throwing error allowed Ruchim and Zach Jones to cross the plate, and that is all Maryland would allow. Reed Mason was on the hill for the Wildcats and was dominant. In seven innings of work he did not allow a run and struck out seven. Only the top three in Maryland’s order were able to get a hit off him. Brandon Lowe got two, and none of them came in the same inning. Kevin Mooney gutted his way through three shutout innings to earn the win Saturday. Even though the bats started ice cold, in the top of the eighth once Mason had exited the game, Maryland’s order finally strung some hits together and was able to do damage. After a LaMonte Wade walk and a Kevin Smith double, Brandon Lowe brought them both in with a single in the left-centerfield gap. Two batters later, Jose Cuas went yard and brought in Lowe, along with himself, and gave Maryland a much-needed lift, and the lead for good. Kevin Mooney, who took over for Selmer before the seventh inning, came back out for the eighth and loaded the bases before getting himself out of the jam. In the ninth, Mooney settled down and shut down the Wildcats to earn the win. Saturday’s win is the 36th of the year for the Terps, setting a regular season school record. They finish the season in a three-way tie with Michigan and Michigan State for the three-seed. All three teams have a 14-10 conference record, but the Terps lose the tiebreaker because of their series loss at Michigan. Fifth-seeded Maryland (36-20) will take on fourth-seeded Michigan State at 10pm ET in the first round of the Big Ten Tournament on Wednesday. MBN will be live from Target Field in Minneapolis, MN to bring fans all the action. Junior Matt Portland struck out nine and allowed just two runs over seven innings for the Wildcats (18-35), who hand Maryland (35-20) another bad loss heading into the postseason. Szefc’s offense mustered five hits all afternoon, all by just two players – shortstop Kevin Smith (three) and right fielder Anthony Papio (two). Both their runs came in the fourth inning on a Papio double as the lone bright spot for a team that was shut out in yesterday’s loss. Northwestern, although they scored just one more run than their opponent, racked up nine hits – six of which came off Terps’ starter Brian Shaffer who was pulled after 5.1 innings of work. Maryland falls to 13-10 in the Big Ten, winning just two of their last eight conference matchups. They face the Wildcats in their season finale on Saturday at 2 p.m. before beginning the Big Ten conference tournament on May 20. Senior Brandon Magallones tossed a two-hit shutout, as Northwestern blanked Maryland 1-0 Thursday afternoon in Evanston, Illinois. Magallones struck out seven and walked only one, limiting Maryland to their lowest offensive output of the season. The opposition had been batting .331 against Magallones this season. The Northwestern righty needed just 91 pitches to beat the Terps in what will be his final collegiate start. Maryland’s bats were held to just two hits Thursday. The Wildcats handed Maryland ace Mike Shawaryn his second loss of the season. Shawaryn allowed one run on four hits over six and two-thirds innings. He struck out seven to extend his conference lead. The lone run scored on a Jack Mitchell double in the fifth inning, which scored catcher Scott Heelan. With the loss, Maryland falls to 35-19 and 13-9 in the Big Ten. Thursday’s loss will significantly tarnish Maryland’s postseason resume, as Northwestern entered the day at No. 156 in the RPI. The Terps and Wildcasts will head back to Rocky Miller Park Friday afternoon for a 4pm. ET first pitch. Freshman righty Brian Shaffer will take on Northwestern junior Matt Portland. The game can be watched on BTN2Go. For the second time in four days, Maryland mounted a comeback but stranded the tying run in scoring position in the ninth, losing to Liberty 7-6 Tuesday at Bob “Turtle” Smith Stadium in College Park, MD. The Terps were down 7-4 entering the final inning and got the first three men aboard before Liberty got back-to-back strong defensive plays from right fielder Will Shepherd and second baseman Nick Salisbury. Flames closer Ashton Perritt held on for the save by striking out Jose Cuas to end the game. Junior lefty Matt Pennington pitched well for Liberty, going six and two-third innings to get the win. Pennington was able to slow down a Maryland offense that put up 39 runs in three games over the weekend at Ohio State. The Terps finally got to Pennington in the seventh, when they scored on an RBI double from Smith and an RBI triple from Brandon Lowe. 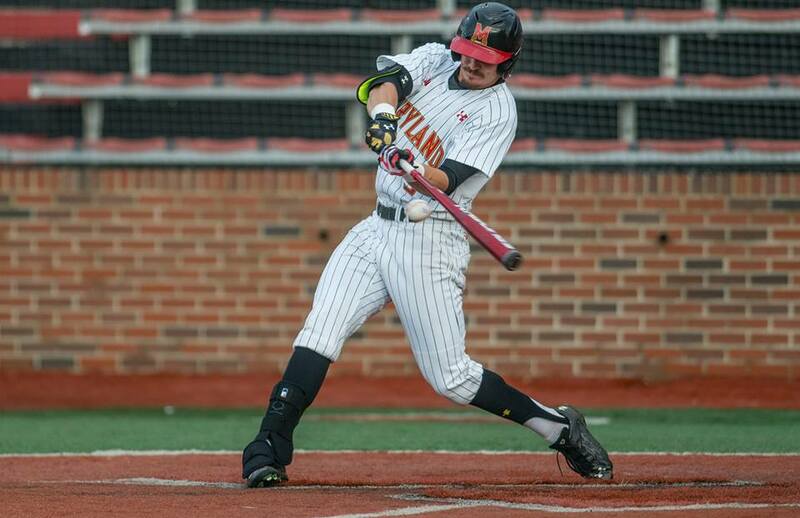 But despite the two-ran rallies in the seventh and ninth innings, the Terps were disappointed in their two run output over the first six innings. “It’s good that we have the ability to come back, but to rely on that all the time is going to be tough, especially in the postseason,” said Smith. Freshman righty Taylor Bloom (1-2) took the loss after giving up three runs in three innings as the starter. The usually stingy Maryland bullpen gave up four runs as well. Following Tuesday’s final home game, the Terps will hit the road for at least the next ten days. They’ll open up a three-game series with Northwestern on Thursday before heading to Minneapolis for the Big Ten Tournament, which gets underway next Wednesday. The Terps (35-17) defeated the Buckeyes (34-15) 14-10 Sunday in the rubber game of a three-game series in Columbus, Ohio after being down 8-3 in the seventh inning. They scored double digit runs in all three games of the series. Maryland Freshman RHP Brian Shaffer (4-0, 5.21) faced Senior LHP Ryan Riga (5-3, 2.86) for the Buckeyes. Neither of the pitchers received a decision in the game that was decided late. Kevin Mooney (2-0) picked up the W for the Terps and Seth Kinker (0-1) received the loss. The Terps’ bats were hot throughout the weekend with a combined 6 home runs, 39 runs and 50 hits over the three games. After a big four-run sixth inning for Ohio State, Maryland responded with seven runs, all on two outs, in the seventh. The big blow, a go ahead three run homer, was off the bat of third basemen Jose Cuas, who says that he was prepared for an off-speed pitch. “The first two were sliders… and he hung [another] slider and I was able to drop the barrel on it,” said Cuas. Maryland head coach John Szefc was excited about the hit production from his team. Cuas is also satisfied with the level of play his team brought to Ohio State this weekend. Brandon Lowe, who was 3-5 with 4 RBIs in Sundays win, sees a similar attitude in the team between now, and last May when the team’s hit production also picked up. The win allows Maryland to move up to third place in the Big Ten standings, opening the chance for a spot in the NCAA tournament.